Football fans displaying Israeli flags at World Cup matches in Russia have been subjected to threats, harassment and violence. In one incident, a man wearing an Israeli flag around his shoulders was filmed as he was being chased around Moscow’s Red Square by men shouting “Palestine,” including one wearing a Tunisian flag. The man wearing the Israeli flag, who was also wearing a kippah, was filmed walking away from the growing group of hecklers along with another man who walked alongside him. The hecklers shouted “Israel the whore” in Arabic, “get lost,” and “f*** you” as the men they were pursuing walked away for long minutes without responding to the taunts. About five hecklers then shouted “Viva Palestine” while waving the Tunisian flag. In a separate incident, the Israel Broadcasting Corp. reported that a man waving an Israel flag during a match between Portugal and Morocco had it snatched from him by fans who wanted to tear it up. 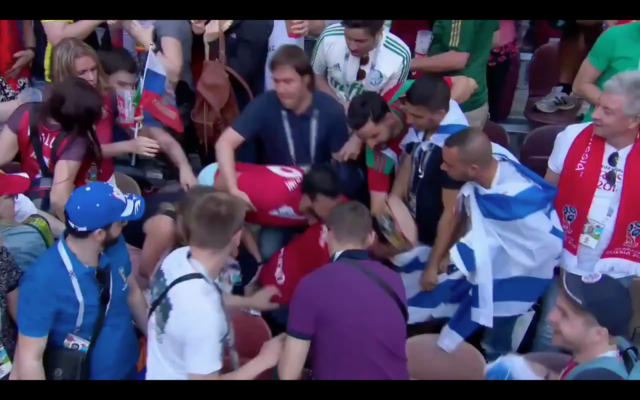 But Israelis who were there during the match Wednesday said a player had thrown his shirt into the crowd and fans were jostling to find it and keep it as a souvenir, the IBC later reported. The monthlong World Cup kicked off last week and is being hosted in 11 cities across the Russian Federation. Hundreds of thousands of fans have poured into Russia for the games, including many Israelis. Football fans from many nations enjoy displaying their national, regional or team flags at matches, regardless of whether teams from those places are playing. Unlike Tunisia, Israel did not qualify to participate in the World Cup.